India’s rapid economic growth is unequally distributed. Some states and social groups benefit as the poor languish. Rapidly rising food prices are fuelling social dissatisfaction in a country where tens of millions of people still lack adequate nutrition. New Delhi (AsiaNews/Agencies) – India’s economy is expected to grow 8.5 per cent this year, making it the fastest growing large economy after China. However, most Indians are angry about a more down-to-earth problem, i.e. the skyrocketing price of onions, which has more than doubled from Rs35 (US$ 0.78) per kg to Rs80 (US$ 1.75) in the past few days, confirming a broader trend of rising food and fuel prices. As economic development helps a minority of India’s 1.2 billion people, the rest remain poor, often without enough to eat. The gap between the two Indias is visible for all to see. On the one hand, the states of Maharashtra, Gujarat, Karnataka, Tamil Nadu and the National Capital Territory of Delhi are the established economies driving India’s growth, with dynamic manufacturing and service sectors. They generate the bulk of exports and attract most foreign investment. There, a small business class is taking advantage of growth with most people settling for low-level blue and white-collar jobs. On the other, there is the rural and populous hinterland of Uttar Pradesh, Madhya Pradesh, Orissa, Chhattisgarh, Bihar and Jharkhand, long characterised by low growth and some of the lowest per capita income. Of these, Bihar has surprised many by recently recording higher rates of growth, but Uttar Pradesh, with a population the size of Brazil and notorious for social marginalisation, trails badly behind. Overall, food prices are rising faster than growth, and onions are a basic part of this dietary staple, especially in the North. In an attempt to cool prices, the government on Wednesday slashed import duties for onions, after banning exports of the vegetable earlier this week. It has already started importing onions from its neighbour Pakistan, buying back produce that it had just sent across the border. A drop in supply caused by unseasonable rains in the western producing states triggered the sudden spike, which was exacerbated by traders keen to cash in on shortages. 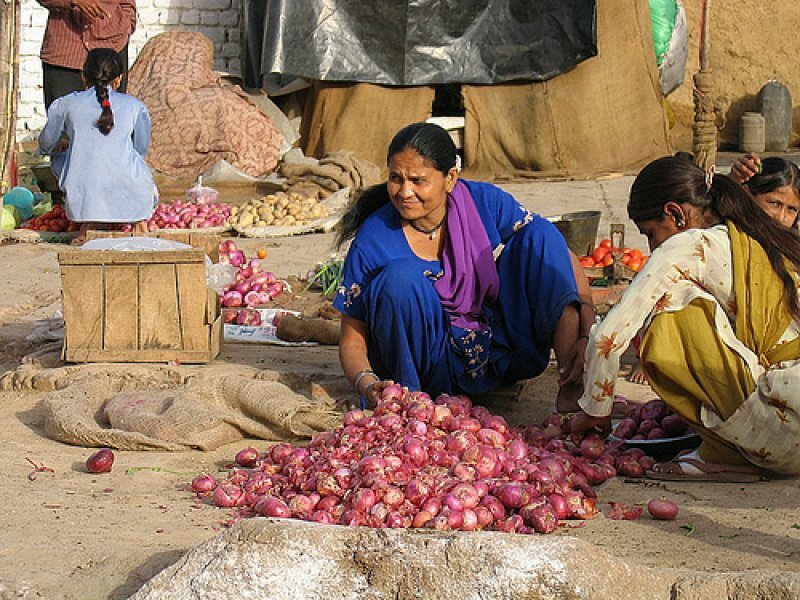 Analysts remember the dramatic rise in the price of onions in 1998, which is credited with ousting the Hindu nationalist Bharatiya Janata Party (BJP) in that year’s Delhi election. It is therefore little surprise that Mr Singh’s office has written to the Agriculture and Consumer Affairs ministries urging them to take all necessary steps to bring prices back down to an “affordable level”. The problem however is structural. On Tuesday, Amartya Sen, the Nobel laureate economist, issued a stark warning to New Delhi about how “stupid” it was to aspire to double-digit economic growth without addressing the chronic undernourishment of tens of millions of Indians and the underdevelopment of highly populated states such as Uttar Pradesh, Madhya Pradesh and Chhattisgarh, which continue to fall behind in terms of income. Rather than seeking to drive growth higher, Sen recommends higher public spending on health and education. Despite rising growth, the average calorie intake among India’s poorest has been stagnant for more than a decade. Eleven out of 19 states have more than 80 per cent anaemia, and more than half of India’s children under the age of five suffer stunting and poor brain development from inadequate nutrition. Analysts warn that the country’s development cannot continue if it exacerbates differences and holds back some states. In fact, social unrest is a real danger in a political situation of high tensions fuelled by allegations of corruption in government circles over a multibillion-dollar telecoms corruption scandal.